Property 6: CESAR AUGUSTO, Apartment in the center! 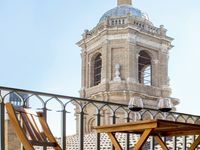 Property 23: 18 TORRES San Lázaro "at the foot of the Ribera"
Property 25: 18 Torres Palafox "Singular Building"
Property 29: 18 Torres Alfonso Attic, "Vistas al Pilar"
Property 36: 18 TORRES Awesome Views! Property 38: Apartment and parking in the Historical Center "El Teatro del Mercado"
Suite next to the pillar garage option. Property 39: Suite next to the pillar garage option. Property 41: 18 TORRES San Blas "Historical Center"
Property 44: FANTASTIC BUHARDILLA PZ. PILLAR.